Last night Finland’s one and only cello quartet Apocalyptica reigned the stage of St. Petersburg’s DK Lensoveta. Despite the fact cello maestros had already toured St. Petersburg last year with the same program, devoted to the 20th debut anniversary of their debut record, the hall was packed as if they’ve made a long-awaited return after a hiatus. 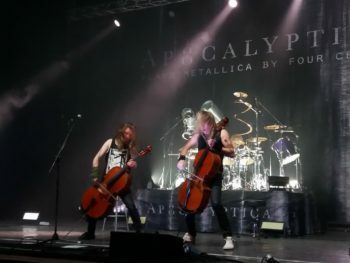 Apocalyptica Plays Metallica by Four Cellos was the band’s first and breakthrough album, so naturally, fans longed to hear their famous Metallica cello covers throughout the night. But on top of that, the crowd also got to hear bonus tracks and almost never played Apocalyptica’s covers of Metallica, extending the live set to two full hours. The night was smartly divided into two halves: an acoustic, classical, “sedentary” part to start with and a fierce, drum-driven second half with all-over-the-stage Apocalyptica that we usually see live. However, compared to last year’s concert, where fans were constantly asked not to jump off their seats, the 2018 anniversary show was significantly “calmer”, and most of the back rows didn’t bother to stand up throughout the entire gig. In fact, after Apocalyptica’s invitation to step closer, stage security even started to encourage people to do so. The acoustic part started off, just like the debut record, with rocking rhythms of ‘Enter Sandman’ and cutting cellos of ‘Master of Puppets’. The two were followed by emboding gloomy ‘Harvester of Sorrow’ and heart-wrenching ‘The Unforgiven’, but I’d like to pause at Apocalyptica’s live rendition of ‘Sad But True’. Its accents pounded hard like an alarm clock, disturbing our dreamy state of mind after ‘The Unforgiven’. However, Perttu Kivilaakso’s pre-solo gestures and grimaces were a bit of a mood-killer really. ‘Wherever I May Roam’ continued the set, and we could feel how close and personal this song is to Eicca Toppinen by the yelling high notes, transmitting his immersion into the song. Then, the frontman introduced “the man from the past”, their fourth original member, Antero Manninen, who played on the debut album, and is now back on the road with Eicca, Perttu and Paavo after many years of walking separate roads. Eicca joked that Antero “cannot smile”, except with the corners of his mouth down. Antero then “revenged” on his mate by dragging with the intro to the next song. Ok, it’s a draw. Little did I notice before the commencing ‘Welcome Home (Sanitarium)’ guided me to some meditative state of mind and inner harmony. Perfect ending of the acoustic set. “Now you can have a coffee and cake… Or vodka,” Eicca joked. Honestly, I can hardly think of a less compatible combination than vodka and Apocalyptica’s concert. And you? Jokes continued also after the intermission. “We’re Apocalyptica,” began Perttu. “We’re strange. We come from Finland. That’s the reason.” Feels like he’s been repeating it over the past few years, though. Time to work on making up new Finland jokes, Perttu! After the band’s drummer joined the band on stage, intensity and power escalated to the maximum. There’s striking difference when percussion creates a sound frame and beat for the purely cello tracks. From ‘Fade to Black’ to ‘Fight Fire With Fire’, the second half of the show was impressively fierce and wildly intense. No need to say that dozens of fans rushed closer to the stage, unable to be stuck to their seat anymore. When introducing Metallica’s ‘Orion’, Eicca mentioned they hadn’t played it live since 1993. The band went on to present one of their first ever tracks ‘Escape’: “We haven’t played it for many years because we couldn’t play it,” admitted the frontman. It was also a pleasure to hear a bit left-behind song ‘Battery’ that night. The last song ‘One’ was definitely a gift for fans, as there was a moment hanging in the air following ‘Nothing Else Matters’ when both the crowd and the musicians felt they simply couldn’t just turn around and leave. To tireless marching “Spa-si-bo” from the fans Eicca even went down to do a little shimmy for us. Two hours flew in an instance, proving it was worth touring gigantic Russia for the second year round with Metallica’s legacy by four cellos. We would like to thank NCA for accrediting us to the concert.